Why All the Fuss Over Indiana’s Religious Freedom Law? Indiana’s new religions freedom law has generated an avalanche of negative response primarily from gay and lesbian groups across the nation, resulting in some refusing to do business in the State. The response was totally unexpected because 19 other states have passed similar laws without any backlash. The Washington Post revealed this fact. So what is all the fuss over this law passed in Indiana? There is a distinction in Indiana’s law that the other states’ laws do not have. With Indiana’s law, disputes between private citizens are included while in the other states, and in the Federal law signed by Bill Clinton, that clause is excluded. The fear is that the new law in Indiana will be used to discriminate between gays and non-gays. I’m amazed we need any laws about religions freedom passed at all. 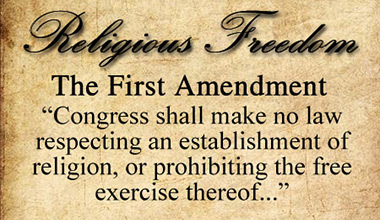 Doesn’t our Constitution of the United States guarantee religions freedom? Of course it does. But there is a continual onslaught of laws that do infringe upon those rights so the need for laws to counteract them seem expedient. Now I didn’t write the Book, and I didn’t create mankind. Neither did you. You didn’t put the ‘natural rules’ into place and all you can do is live by the natural order or corrupt it. We clearly see God’s attitude toward those who corrupt it. He allows them to corrupt themselves because of their attitude. I obviously think homosexuality and lesbianism is sinful. It’s against God’s natural order. I base what I believe on the written Word of God. With that in mind, here is my question. Shock horror! Did I really say that? Hmm… let me explain. If I teach something in God’s Word to someone — anyone — am I not serving that person? It doesn’t matter if it’s a gay person or not, I am serving that person God’s Word. Is there anything wrong with serving a gay person the Word of God? Of course not. That’s what serving people is all about — helping them with whatever they need that you are able to supply. So what’s the ‘big deal’ if a gay comes into my restaurant and I serve food to that person? What’s the big deal if I own a bakery and a gay couple comes in and orders a wedding cake? Am I in violation of anything if I serve that cake to the gay couple? I am violating my conscience if nothing else. That, I should not be forced to do. Now let’s change the scenario. Let’s say I’m a Christian minister who can legally perform wedding ceremonies. If I agree to perform the ceremony for a gay couple, now I’m crossing the line. Now I have to explicitly go against what the Bible clearly says is wrong to meet that gay couple’s needs. If I do so, I am violating not only my own conscience but God’s Word itself. That I will not do and I should not be required to do it under any law of man. The Constitution of the United States guarantees my religions freedom. It guarantees that the government can pass no law that infringes on my free expression of my religions beliefs. If that same government makes me perform a marriage ceremony for gays and then accuses me for discrimination if I don’t, we have a big contradiction. In summary, it’s a shame states like Indiana have to pass religions freedom laws when our very constitution guarantees it. More startling is the outrageous reaction by businesses and other organizations to Indiana’s new law. You would think Americans would stand up for our Constitutional rights. This doesn’t seem to be the case any longer. Will they be so vocal then?